Have a birthday to celebrate? 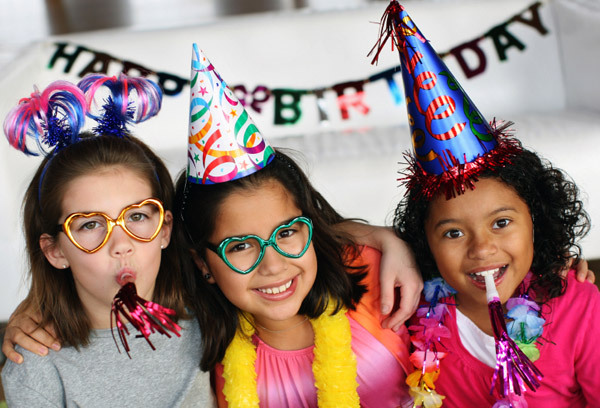 Here are some great party places for you and the kids to have a fantastic, memorable birthday party here in Arizona! Of course, these places don’t only do birthday parties! Some of them are also suitable for bar and bat mitzvah parties, quinceaneras and all kinds of other family events and get-togethers. About: Makutu’s Island is a tropically-themed 20,000 square foot, multi-level indoor playground in Chandler. At its center is a its 25-foot indoor old oak “tree” that is filled with play tubes, tunnels, fire poles, slides and other amusements. To book a party, two weeks advance notice preferred, but as little as 24 hours ahead of time may work if there’s a room open. Online invitations and thank you notes available. With locations in both Phoenix and Mesa, Jambo is just right for the younger set. They offer things like a mini roller coaster, a big soft playground area with slides and tunnels, mini bowling, indoor miniature golf, robotic animals, laser tag, food and more. There are two party rooms that can hold up to 40 people ach, and a large lodge room that works for up to 120 people. Kids age 6 and under will love this child-sized indoor play town with play houses (including a school, hospital, home, bakery, market, fire station and others). All of Sunday is set aside for private parties, and they offer several theme options plus lots of flexibility to help make the event as stress-free as possible for the parents. Kids age 6 and up can celebriate their birthdays at the Arizona Science Center in Downtown Phoenix! The museum’s party packages include a private room for an hour, themed activities, admission to the rest of the Science Center after the party and other fun. Parties are hosted only on Saturdays, from 10 am to 1:30 pm. Read more about the Arizona Science Center here! Have an astronaut in the making? Up in Peoria at the Challenger Space Center, your future space farer can enjoy one of the party packages for for kids of all ages (and even for grown-ups, too). Most parties have a minimum size of 10, but The Space Center can accommodate up to 30 people per event. As you might expect, the packages even have festive space-exploration-themed names: Cadet Party, Stargazing Party, Planetarium Party, Out-of-This-World Party. Find out more about the Challenger Space Center here! The go-to spot for birthday parties for more than 25 years, Chuck E. Cheese’s was created by the founder of Atari and Pong, Nolan Bushnell, to give kids a place to play video games in a family-friendly atmosphere. The locations still offer video games plus other attractions like roller coaster simulator rides and the Skytubes ceiling mazes — along with staples like air hockey and other arcade games. Each venue is separated into three different sections to appeal to kids of all ages: the toddler zone, the kiddie area, and the skill games/arcades area.